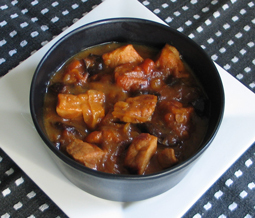 Pork Stew with Apricots and Prunes - A recipe from Savor California, the online showcase for extraordinary gourmet foods and beverages from California. Melt butter with oil in heavy large Dutch oven or casserole over medium-high heat. Add pork in batches and cook until brown, stirring occasionally, about 4 minutes. Transfer to bowl using slotted spoon. Add onions and garlic to same pan and cook until tender, stirring occasionally, about 10 minutes. Add flour and stir 3 minutes. Mix in broth, cider, beer, mustard, coriander, cinnamon and salt and bring mixture to boil. Return pork and any juices in bowl to Dutch oven. Stir in apricots and prunes. Cover and bake 1 hour. Remove lid from Dutch oven and continue baking until pork is tender and liquid is reduced to sauce consistency, about 45 minutes longer.